Funding from the German government has enabled the International Commission on Missing Persons (ICMP) to purchase state-of-the-art technical equipment which will enhance its high-throughput DNA identification system. 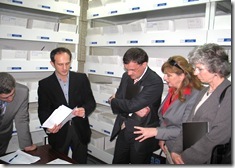 Visiting ICMP’s Identification Coordination Division and the Podrinje Identification Project in Tuzla, H.E Joachim Schmidt, German Ambassador to Bosnia and Herzegovina, praised ICMP’s DNA-assisted identification system and the improvements made to it by the recent German donation. A delegation of six Cypriot and Turkish Cypriot scientists working for the Committee on Missing Persons in Cyprus (CMP) attended a training course provided by the International Commission on Missing Persons (ICMP) in Bosnia Herzegovina. The purpose of the visit was to provide the bi-communal team of Cypriot scientists with the opportunity to broaden and enhance their existing forensic and anthropological skills.